Due to personal circumstances guitarist extraordinaire Santiago Dobles (Aghora, Cynic) will not participate in future live-performances with/for Pestilence. Santiago’s latest contribution are some excellent solo’s on Pestilence’s upcoming album “Hadeon” (coming in March 2018). For now this ends Santiago’s involvement in Pestilence, but we would not be surprised if he will be a guest on any future recording. So Pestilence welcomes Calin Paraschiv as their new guitarist. Calin hails from Rumania, and plays in another project (Necrovile) with current Pestilence drummer Septimiu Harsan. He is not a starting musician, but someone who knows the drill for the last 25 years. Patrick Mameli on Calin: “Calin is the right man for the job, a skilled and professional guitarist ready to tour across the world. Rehearsing together with Septimiu is a big plus, so the choice was an easy one to make”. 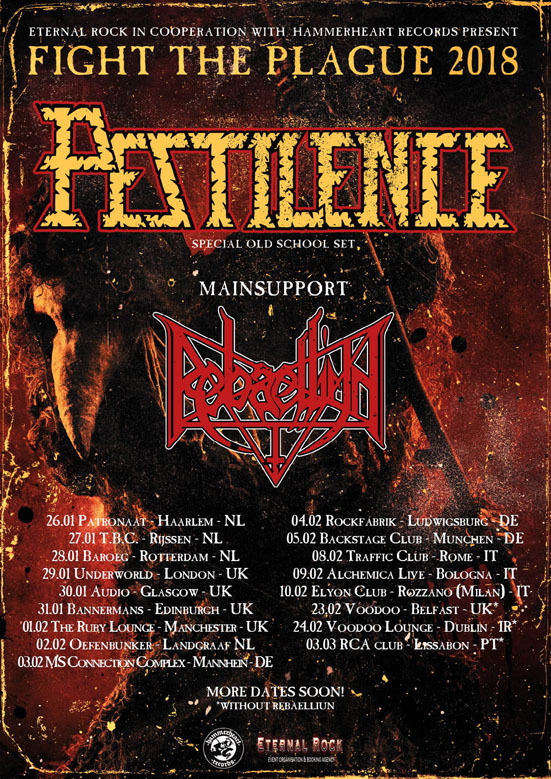 Pestilence announce first European headline tour dates! 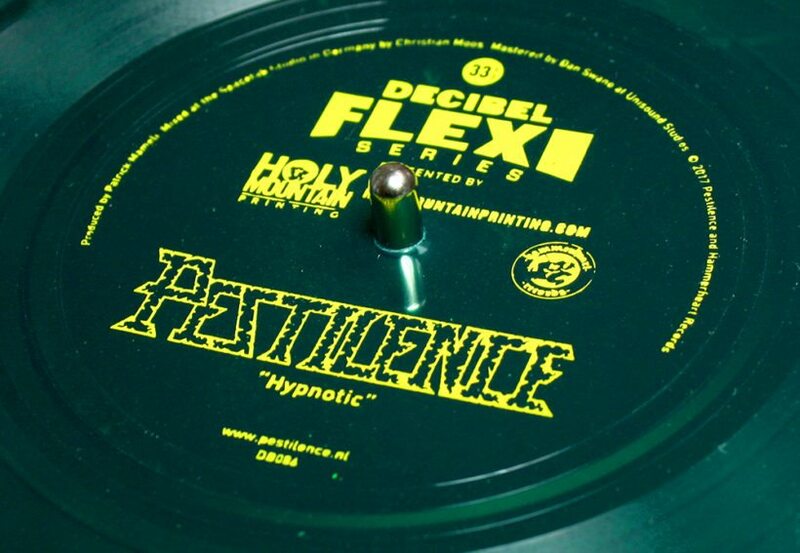 Dutch Death Metal legends Pestilence have announced a full European headline tour for January/February called “Fight The Plague”! 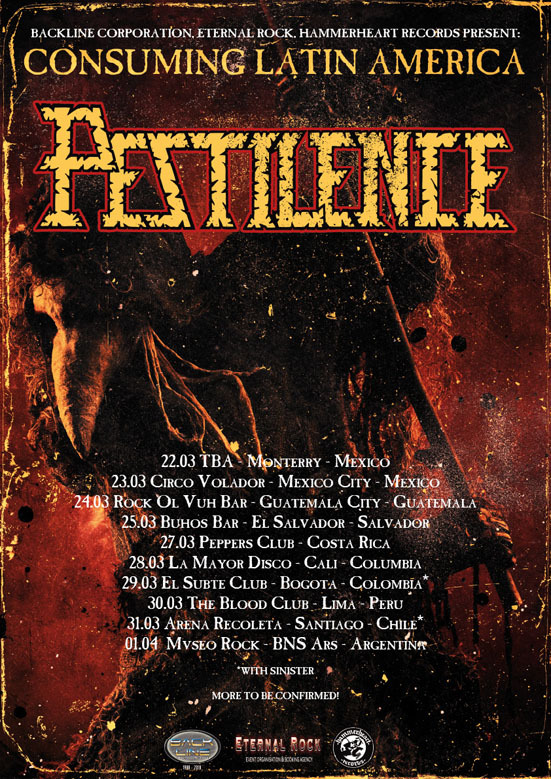 Pestilence will play a special old school set with songs from the first 4 classic albums “Malleus Maleficarum”, “Consuming Impulse”, “Testimony Of The Ancients” and “Spheres”. Support is provided by Brazilian Death Metal outfit Rebaelliun! A list of the first announced tour dates is available below.